I like more. I like a lot. I see that bumper sticker, “Simplify” and I want twenty. I have more coats than there are winter days. I hoard pens. I covet shoes. I like stuff. Most families I know have one nativity set. One. They set it up this time of year with the requisite camels, lambs, Mary, Joseph and three Wise Men. It’s simple. It’s done. No great shakes, no need for a Jesus Hotel. And what is a Jesus Hotel you ask? Well, since I enjoy the art of collecting, I have not one but seven nativity sets. Seven. I’ve got one inherited from my mother, one I found at an airport in Mexico, another from Spain, two given as gifts and two from my thrift shop haunts. And I love them, love setting them up, love placing them around our home. Alas, I digress. A Jesus Hotel is where all the Jesuses (Jesusi?) hang out until Christmas morning. 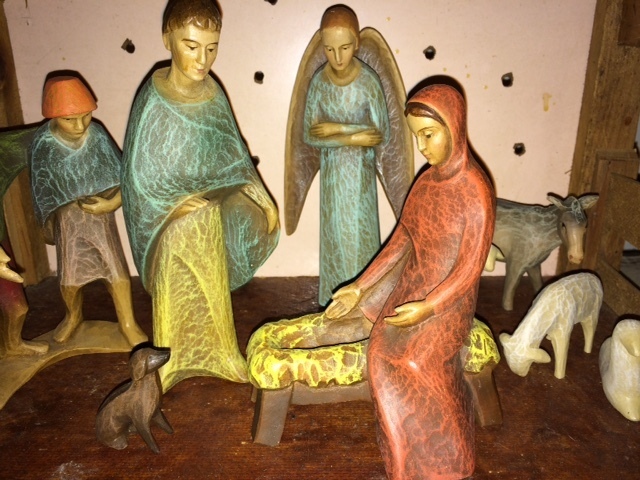 It’s a tradition in our home that the manger’s crib remains empty until Christmas morning. On the 25th, the Jesusus check out of their hotel room (they all stay together) and we sing, “Happy Birthday” to the group of baby Jesuses. It’s quite a gathering, quite a party, like any former hotel guest, Jesus is happy to return to his own bed, his own crib. And then we open gifts. The Jesus Hotel generally remains empty until the following December, but on occasion, there can be a guest or two late in the year and in early January. You see, we don’t place the Wise Men in the manger until January 6, Epiphany. Gaspar, Melchior and Balthazar sometimes stop in, using the Jesus Hotel as a bit of a respite on their journey, an Airbnb if you will. It’s a cozy place to stay. Jesus has always given us five stars. We may expand on the Jesus Hotel should I find another nativity set I cannot live without. And in my experience? You can never have too many Jesuses in your life, in your Jesus Hotel. And there may not have been room at the inn, but I muse joyfully there will always room at the Jesus Hotel.